Unsung asks the question why are women so underrepresented, undervalued and under-acknowledged? It homes in on the four remarkable women – Countess Ada Lovelace, inventor of the first computer, Sophia Jex-Blake, the first female Doctor, Lillian Bader, the first black woman to serve in the RAF and Andrea Dunbar, working-class female playwright. Although their lives span the nineteenth and twentieth centuries the writer Lisa Holdsworth puts them on stage together telling their stories as if in the present. So it’s as if they are alive today looking back on their lives and asking why are we still struggling for recognition. 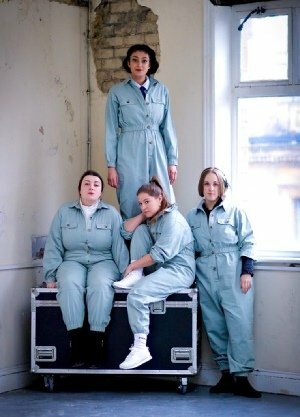 The sense of the contemporary is conveyed in many ways such as having all 4 women dressed in RAF jumpsuits with their names on tags stitched into the suit. But most especially by the electronic atmospheric music from Leeds based band Peakes and the haunting vocals of Molly Puckering. Together the music and vocals create the bittersweet sense of aspiration and frustration that is a mark of the play. Ada Lovelace (wonderfully evoked by Olivia Race) writes an equation on the blackboard A = R. Where A stands for achievement and R for recognition. As a mathematician, she expects to see a direct relationship between the two but she notices that for women the equation doesn’t work. This baffles her and provides the starting point for the play’s exploration of these four lives. In a brilliant piece of physical theatre all four act out repeated moments of hitting the glass wall of male rejection. Exhausted and defeated they repeat the mantra of their struggle: Education, Job, Respect, Voice. Education, Job, Respect, Voice. As each, in turn, tells their story it is taken up by the next seamlessly in a continuous narrative of aspiration rejected. At this point, Ada Lovelace adds the Letter F to her equation. F standing for Female. Again she desperately tries to fit this variable into her calculation. As she so beautifully puts it, ‘mathematics has freed me and now I intend to free it from all its male distortions‘. However, now Ada faces two new challenges to her maths. First, Lillian Bader (Riana Duce) reminds her that she needs to factor in race and then Andrea Dunbar brings up the C word, class. This scene is the best dramatization of the holy trinity – gender, race, class – that I’ve seen anywhere on page, stage or screen. The play is full of telling details. Sophia Jex-Blake (Kirsty Pennycook) having to listen to her lectures at Edinburgh University behind a curtain, receiving obscene letters from outraged male medical students, Andrea being punched by her partner or Ada dying aged 36. Ada comes to the conclusion that women will have to do it themselves as men won’t give up their power. She ends with a new equation R = A + T / + R+R+R. Recognition equals Time plus reclamation, rediscovery and reawakening. And it will be women who do it for themselves. Unsung is a one hour tour de force of compelling storytelling. Female theatre-makers team up with screenwriter Lisa Holdsworth to tour UNSUNG, a new piece of feminist theatre charting the untold stories of the women who made – or ought to have made – British history. UNSUNG explores the untold stories of Ada Lovelace, Sophia Jex-Blake, Lilian Bailey and Andrea Dunbar, asking why they, and hundreds like them, have been relegated to the footnotes of history. The show is supported by Arts Council England and the Fenton Arts Trust, and arrives at the King’s Head Theatre in Islington as part of a national tour. JOHN O’BRIEN born in London in 1960 is a born and bred Londoner. His mother was an illiterate Irish traveller. His early years were spent in Ladbroke Grove. He was born at number 40 Lancaster Road. In 1967 the family was rehoused in Hackney. He attended Brooke House School for Boys in Clapton, - as did Lord Sugar. He became head boy and was the first person in his family to make it to university, gaining a place at Goldsmiths College in 1978. He took a degree in Sociology and a PGCE . From 1982 until 1993 he taught at schools in Hackney and Richmond. In 1984-85 he attended Bristol University where he gained a Diploma in Social Administration. From 1985 until 1989 he studied part-time in the evenings for a degree in English Literature at Birkbeck College. He stayed on at Birkbeck from 1990-1992 to study for an MA in Modern English Literature. He left teaching in 1993 and has worked as a tutor, researcher, writer and tour guide. He leads bespoke guided tours on London’s history, art , architecture and culture. He has attended numerous courses at Oxford University - Exeter College, Rewley House & Kellogg College. In London, he attends courses at Gresham College, The National Gallery, The British Museum, The Paul Mellon Centre for Studies in British Art, The British Academy and The Royal Society. Read the latest London theatre reviews by all reviewers.